Let’s not forget the gentlemen. Within this category you’ll find cuff links, rings, bracelets, necklaces etc. for the man in your life. High polished curb link bracelets are one of those gents jewellery staples that are always in demand. If however you’re looking for a little more self expression you might want to try this reversible patterned version. All high polished on one side but on the opposite face you’ll find an odd mix of stippled texture with bark edges. Each link is able to be rotate, aligning perfectly with each other, alternating, or forming a random pattern of your choosing adding to the unique nature of the piece. 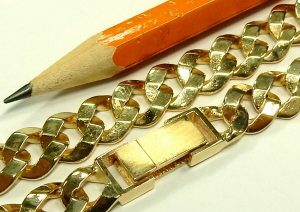 Measuring 8 1/4 inches long and 8.95mm wide the 10 karat yellow gold bracelet is appropriate for most wrists. It has been equipped with an integrated catch more than secure enough for its 22.9 gram weight. Estate price $810.00 CAD. Stock #e11995. There seems to be a void in men’s ring styles, jumping from nice diamond wedding bands right to heavily adorned statement rings. In between those two categories there should be more rings like this one. 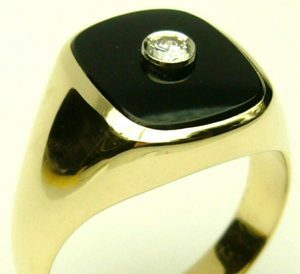 Made striking not by busy details but by simple stark contrast between smooth high polished yellow gold, glossy black onyx and a bright shinning diamond set into white gold. 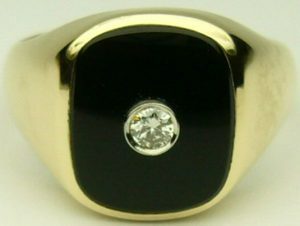 It was also made to last, employing sturdy bezel settings holding the high quality VS-J 0.34 carat round brilliant cut diamond and 16mm by 12mm smooth black oval onyx. Made from solid 14 karat yellow gold weighing 11.30 grams the ring is of heirloom quality. It’s currently a finger size 11 1/4 with room for some sizing. This ring will turn heads because it was designed to be calm and bold instead of eye catching. Estate price $1,750.00 CAD. Stock #e9776. If you’re shopping for maximum impact on a budget a hollow rope chain is the link of choice. Made up of interwoven tubes formed into rings the style makes a highly durable design that looks very impressive but doesn’t break the bank. Even though it’s hollow it still weighs well over 1 ounce at an impressive 33.9 grams. With mindful wear the heavy gauge hollow construction will last decades. Keep it clean and avoid activity that may expose the chain to a sharp force or hard impact and you’re good to go. The chain has received some minor impact dings near the clasp, they can only be found under very close inspection. 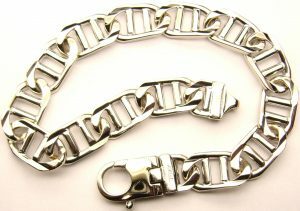 The 7mm wide 10 karat chain is equipped with large jump ring ends and an ultra heavy lobster clasp for easy fastening. However at 26 inches long you can skip the clasp and simply slip the chain over your head. Estate price $1,380.00 CAD. Stock #e11884. I really don’t think this bracelet has ever been worn, it definitely has never been engraved. 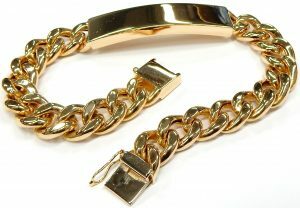 The 10 karat curb link design bracelet weighs 32 grams and is secured by a very expensive “G” lock. It measures approximately 8 inches long so it would fit a man with a smaller wrist. We will engrave the plaque with your instructions for no charge. It is estate priced at $1,435.00 CAD. Stock #e6184. The inventive indents carved into the sides of this ring are designed for added comfort between the fingers during wear. A large adjustment in the finger size pushed the indents closer to the top but still provide a comfy clearance for neighbouring fingers. The ring carries a resemblance to some sort of brass knuckle, adding an edgy twist. Obviously custom made being a solid 8.1 grams of 14 karat white gold set with 0.60 carats of bright I1-IJ round brilliant cut diamonds (one chipped). The millgrain edge is a nice finishing touch for this one of a kind gents ring which currently measures a finger size 11 with room to adjust. Estate price $1,050.00 CAD. Stock #e10578. At Bill Le Boeuf Jewellers we have more chains than we have room in our showcases to display them. Being the most timeless and necessary of jewellery items we always aim to keep a large stock of new options. Most lighter chains that come in for sale or trade have been worn out and end up at the refinery for recycling. 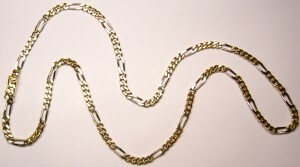 Gents chains are made heavier and more robust, often showing no signs of wear what-so-ever. 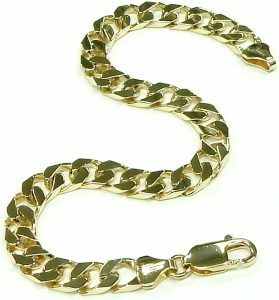 Meaning we have a very large and extremely varied offering of gents chains. 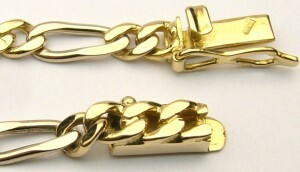 Take this 22 inch long Italian made curb link for instance, made from 12.4 grams of high quality 18 karat yellow gold. The chain came in showing no signs of wear, not even needing a polish, but considering its pre-owned nature it’s been priced as aggressively as possible at only $1,036.00 CAD. Stock #e10354. We have the privilege of having all manner of jewellery art pass through our estate department. Of all the horse carvings we’ve seen this is by far the best. The elegant and detailed bust is a masterpiece of carving. The one of a kind piece was obviously made to commemorate an individual horse. The unique star marking on the horses forehead has been captured in a 0.15 carat high quality VS-H marquise cut diamond. To finish off the graceful ring the bit and bridle have been crafted from bright white gold, a cool contrast to the warmer hue of 18 karat yellow gold. As with most hand made pieces the ring boasts a substantial 11.5 gram weight, a testament to its quality. Currently the ring measures a finger size 10 with some room to adjust up or down. Estate price $1,470.00 CAD. Stock #e11062. Synthetic moissanite has occasionally been used as a diamond substitute for a couple of years now. We come across this unusual mineral once in a while but this is the first time we’ve seen it in a gents ring. For those of you who aren’t up on the trend, moissanite is a man made gem that was introduced in 1998. It’s actually a decent alternative to a diamond being the next hardest gemstone on the MOHS hardness scale, with similar optical properties. It actually displays slightly more dispersion than a diamond and tends to be a warmer colour; sitting somewhere around a K on the GIA diamond colour grading scale. This slight mild tint actually makes it a more convincing diamond substitute when compared to completely colourless cubic zirconia. Measuring 7.5mm in diameter the stone has been calculated to weigh approximately 1.35 carat. 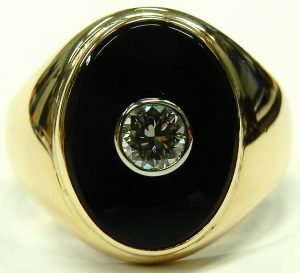 It’s an impressive looking centre piece, bezel set into a unique 20.1 gram, 14 karat white and yellow gold men’s ring. 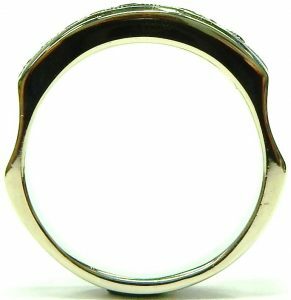 The extremely well made ring is one of the more modern looking and striking gents ring we’ve had come through our estate department. The ring is brightly polished and measures a finger size 11 1/2 with some room to go up or down. Estate priced at $1,950.00 CAD. Stock #e9949. 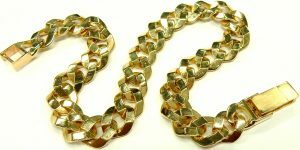 Two for the price of one thanks to the patterned and high polished faces of this reversible curb link chain. The statement chain measures a wide 8.5mm and 21 inches long sure to stay put over top of most shirt necks. Despite its size the 47.7 gram chain wears lightly, you’ll know it’s on but it won’t get in the way. The square curb style is timeless and it features an integrated catch that almost disappears during wear. The calmer 10 karat yellow gold tone leaves it understated if worn on the patterned side or brightly flashing worn on the reverse. Estate price $1,800.00 CAD. Stock #e11858. Don’t let the hollow construction scare you, this ID bracelet is very well made and made to last. Measuring a gents length of 9 inches the bracelet combines the iconic curb link with an over sized engraving plate. That plate curves gently to contour to the wrist and spans an impressive 46.0mm by 11.1mm and 4.5mm thick. It’s no wonder the bracelet is hollow as it was made from top quality 18 karat yellow gold. The sturdy box catch mirrors the dimensions and appearance of the ID bar as a finishing touch, tying the bracelet together. It’s equipped with an additional safety lock for extra peace of mind during wear. Engrave a hidden message on the inside for only the wearer’s eyes or a bold message across the front for the world to see. Hollow yes but with a finished weight of 39.7 grams this is no fragile light weight piece. If kept clean and not subjected to excessive treatment this bracelet will last a lifetime. Freshly polished and looking like brand new. Estate price $2,400.00 CAD. Stock #e11662. Try this two tone bracelet on and you’ll see why it’s so hard to capture in photos. The white gold rectangles that make the base for each fancy link have been polished to a bright mirror finish. Thanks to the curving design of their yellow gold connections, those mirrors flash blindingly at the slightest movement. As you’d expect of the Italian master goldsmiths the bracelet is made to that coveted wear-it-and-forget-about-it quality. Everything about it is solid and sturdy, weighing in at an appropriately heavy 31.5 grams of 10 karat gold. Suitable for a gentle man with an average sized wrist or any lady. The brilliant bracelet measures a longer 8 1/2 inches and is estate priced for $1,400.00 CAD. Stock #e11591. Well over 1 million members located in over 100 countries around the world make up the Harley owners group. The membership organizes many ride related rallies that often raise money for various charities including their official cause of Muscular Dystrophy. Almost every community that has a Harley Davidson Motorcycle dealership also has a H.O.G. chapter sponsored by the dealership. I’m sure some of our customers wouldn’t mind having a little pendant like this one. It could be added to a charm bracelet or perhaps to the key ring of your favorite ride. The pendant looks like new, cast from over 2.4 grams of 10 karat gold, measuring 19.2mm x 13.5mm. The back of the pendant has a flat finish that could be engraved with your motorcycles serial number or a special message. The high quality pendant shows great detail. A Sandblasted background with polished highlights and frame provide excellent contrast. Estate price $175.00 CAD. Stock #e8737. 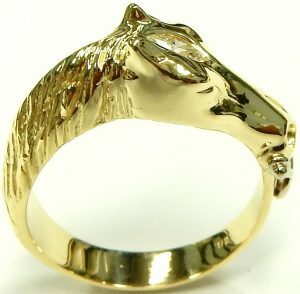 I’m not necessarily a horse person but I find this ring quite attractive. There are just some shapes and designs that are appealing for no other reason than then they look good. It feels great on your finger too because of the solid construction and 12 gram finished weight. An excellent choice for the equestrian type, the cowboy or maybe just for someone who’s a cowboy at heart. The hand made ring measures just a little bigger than average at a 10.5. Bead set across the top of the shoe are 12 good quality SI-G round brilliant cut diamonds that total an estimated 0.36 carats in weight. The simple high polish finish is easy to maintain and easy to keep clean. Measuring less than 3.5mm in height this ring is just as comfortable as a plain wedding ring. In fact for the right person it could be used as a wedding ring. 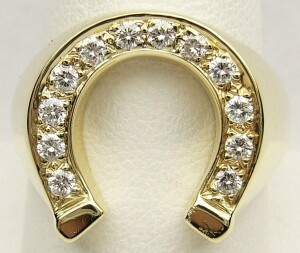 With the horseshoe theme it may even bring you some good luck along the way too. Our on staff goldsmiths can adjust the size up or down a little if needed. Estate priced at $1,400.00. Stock #e9250. We love the durability, the weight, the purity, the rarity and the soft white colour that platinum offers. What makes this scarce metal so long lasting also makes it waaaaaaay harder to refinish than traditional yellow, white or rose gold. This 4.5mm Canadian made ring was worn every day without regard to the type of activity it was subjected to. As such it displays the typical scuffs, scratches and minor dings associated with continuous use. Refinishing platinum takes more time, requires specialized tools and techniques to restore an original mirror finish. We opted to leave this one alone only applying a light polish preserving the original patina. One of our goldsmiths can easily restore it to new condition if you prefer. A full and complimentary restoration will require sanding entire surface with several stages of increasingly finer grit paper. Only after every single minuscule scuff and minor surface imperfection has been eliminated can we take it to the high speed polishing wheel using only specifically designed compounds. To do a full restoration will result in a few percent of metal loss and reducing the overall intrinsic value. We’re happy to do it but it can only be original once. The size 10 1/2 ring can be custom fit to virtually any finger size. 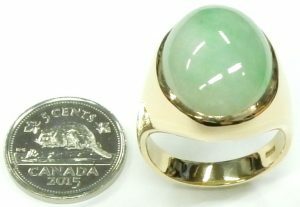 At 6.9 grams this ring offers excellent value for the estate price of just $500.00 CAD. Stock #e11100. 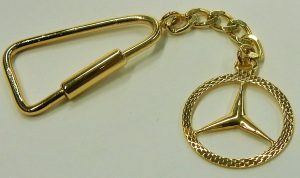 For the car enthusiast who has almost everything I present a solid 14 karat gold Mercedes Benz key ring. We seem to get more Mercedes Benz merchandise than any other automotive brand for some reason. This particular piece is one of the nicer ones, made in Italy from 6.2 grams of high polished 14 karat yellow gold and measuring 8.5cm long. The key chain attaches via gold carabiner style threaded sliding lock that adds extra security. The logo itself measures 20mm in diameter and is decorated on the outer rim with a radial cross hatched pattern that catches the light and draws the eye in toward the iconic three pointed star logo. Estate price $490.00 CAD. Stock #e9478. 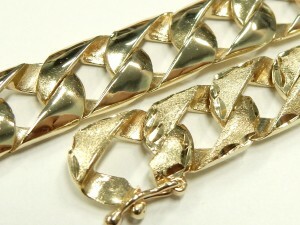 His or her’s reversible gold bracelet. Perfect condition with brushed/bright cut edges on one side and completely polished on the other. Easily shortened while you wait if it’s too big. 8 1/2 inches total length and 8mm wide. Super strong nautical link made from cast solid links. Finished weight in 10 karat yellow gold is 14.1 grams. Looking unworn showing no wear on any of the 18 links. Secured by an integrated link clasp with side safety. Estate price $560.00 CAD. e11602. It’s got the width and weight of a gents bracelet but at 8 3/4 inches long it may be just a little tight for the larger guy. We can easily make it a bit shorter for anyone with a slightly smaller wrist who likes the look and feel of a well constructed solid link bracelet. It’s in excellent condition showing no wear in any of the links or the heavy lobster clasp. You can usually count on Italian manufacture for high quality finish/construction and this bracelet is no exception. 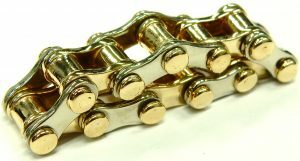 Full solid end link caps, a soldered connecting ring and a sturdy over sized clasp are features designed to stand up to the rigors of day to day use. Freshly polished and ready to go. Estate priced at $910.00 CAD. Stock #e11507. Rose gold is becoming popular again. Many high end watch manufacturers like Rolex, Breitling and Omega are showcasing rose gold in their luxury creations. Manufactured by UnoAerre Italy; one of the great jewellery and chain makers. What gives this chain its soft rose tone is the slight bias of copper in the alloy mix. Not only does copper give the chain a slight blush it also makes it quite hard. Measuring 21.5 inches long, 6.0mm wide it should fit most men perfectly. With a weight of 22.8 grams it’s substantial but not of Mr. T. bulk. Secured by a sturdy lobster catch and freshly polished to look like new. 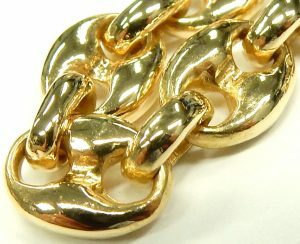 Showing no wear of any kind the chain is estate priced at $980.00 CAD. Stock #e11964. The perfect gift for the die hard Barrie Colts fan. Charlie Horse pendant made from 4.2 grams of 10 karat yellow gold. The well made piece will (hopefully) act as a good luck charm for you and the Colts thanks to the lucky horseshoe built into their logo. The pendant itself measures an impressive 24mm long by 20mm wide and is equipped with a heavy bail large enough to accommodate almost any chain. “GO COLTS GO!”. Estate price $245.00 CAD. Stock #e10103. Many people only consider custom making a piece of jewellery when shopping for a unique engagement ring or wedding band, but custom work can be any number of pieces. Some of the most rewarding pieces we make start with a customer’s simple sketch on a scrap of paper. As our customers are not professionally trained jewellery illustrators the sketch rarely reflects the image they see in their heads. Our goldsmiths and designers work with them to flush out their design and the results are just as thrilling for us as they are for our customer. This 60.0mm long by 38.6mm wide Celtic inspired cross was a spare in a series we made and was subsequently traded back making it a brand new, never worn addition to our estate department. A welcome addition as the 7.6 gram 14 karat yellow gold cross is very well made (if we do say so ourselves), equipped with a substantial bale strong enough to last a lifetime of constant wear. Estate price $560.00 CAD. Stock #e10040. Consumer items today have little or no intrinsic value of any kind. You buy it today, use it tomorrow then throw it away with little regard to what it cost when new. Even a brand new car you buy today for $25000.00 is ultimately worth only a few hundred dollars in 10 or 15 years. A high quality chain like this is quite another story. 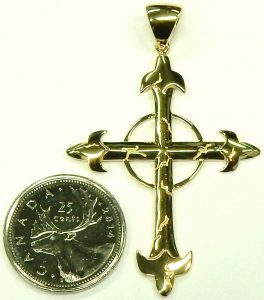 With the price of gold currently at about $1600.00 per ounce Canadian this chain has around $2625.00 worth of gold and $15.00 worth of fine silver in it. You could run it over with a train and it would still have the same value of recyclable precious metal contained within the flattened links. 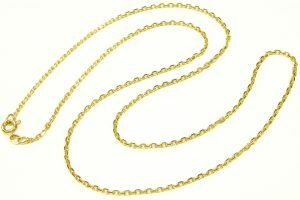 The popular style Figaro link 18 karat yellow and white gold chain measures 5.6mm wide and 29 inches long. It weighs over 68 grams and is secured by a hidden plunger style clasp with a heavy side safety catch. 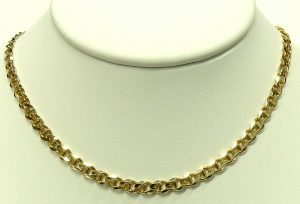 Solid link chains like this are very expensive to manufacture. The replacement value of an imported necklace like this could easily exceed $6000.00. This example is in like new condition showing no signs of wear, all the links and joints are in excellent condition. Estate priced at $4200.00 CAD. Stock #e8179. Dynamic gents rings are few and far between but always such a pleasure when they do turn up in our estate department. This one especially is made to that coveted ‘quality you can feel’ standard. Weighing in at a hefty 11.9 grams of warm 14 karat yellow gold you won’t easily forget you’re wearing the ring. The geometric, hard lined top draws attention by contrast to the perfect circle of brilliance suspended in the void. At a perfect 1/2 carat, eye clean SI1 clarity and I colour the diamond is well deserving of its seat. No surprise the ring is a one of a kind, custom made piece. It was manufactured back in 1992 but still looks just as fresh and modern today, a testament to its timeless design. This ring would certainly sell for much more than the original purchase price 26 years ago of $2300.00. Gold has more than tripled in cost since 1992. 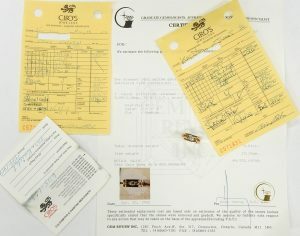 The like new ring comes with its original Ciro’s Jewellers receipts, warranty card, and insurance appraisal. The ring currently measures a finger size 8 with plenty of room to adjust up or down. Estate price $2310.00 CAD. Stock #e11416. Now here’s a not too subtle lifestyle statement. Custom made for a gentleman in the 1960s. 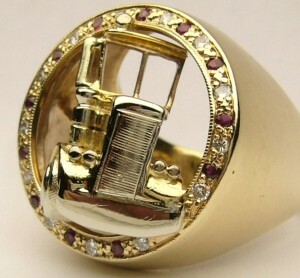 This trucker ring was his pride and joy for almost half a century. Now it’s time to find it a new home with someone who can continue the adventure for another million miles or more. The circular 10 karat yellow gold ring is a size 12.5 with a circular frame setting measuring 25mm diameter. A three dimensional freightliner tractor cab is exploding out of the centre of the ring looking like it’s doing 60 miles an hour. When I look at this ring it’s hard not to smile and imagine the sense of pride the original owner had in it and his trusty 18 wheeler. I’m sure it was the nicest on the road. It took great a great amount of skill to assemble all the different little pieces of 10 karat yellow and white gold together then solder it all into the ring. 25 round faceted good quality rubies and diamonds are bead set in the frame adding approximately 0.50 carats of bling. Today this ring would be a very expensive custom project to produce. I hope it finds a great home with a man who takes pride in his work and is not afraid to express it. Estate priced at $1440.00 Stock #e8231. Perfect condition showing no wear between links. This 8.25 inch long bracelet has a brushed finish with bright diamond cut edges on one side and a plain highly polished reverse side. 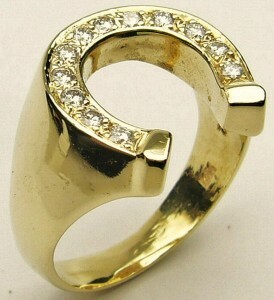 You can have the traditional attractive shiny gold appearance or go for an interesting contrasting satin/sparkly look. Either way you’ll be getting a great estate bracelet for a significant discount when compared with new. At just over 8 inches in length it will suit the slightly smaller gentleman’s wrist. A few links can quickly be removed and all of a sudden you have a ladies bracelet of any length you like. 9.0mm wide with a finished weight of 19.9 grams will feel great on your wrist. Estate priced at just $720.00 CAD. Stock #e9403. Sure $1800.00 is a lot of money, but here’s an interesting way to consider the type of value this necklace offers. If you bought a new car today for $40,000.00 and keep it until there is nothing left but a little bit of paint between the rust and it’s totally used up, it will likely be worth around $400.00 ($200.00 per ton). Compare that to this chain. Keep it clean, wear it every day and it should easily last many decades. If the price of gold doesn’t change from $1560.00 per ounce Canadian it will still be worth around 2.5 times that of what your once $40,000.00 car is now worth as scrap metal. Even if you run this chain over with a train it still contains around $950.00 worth of fine gold (not to mention some fine silver too). I know you can’t drive your chain to Florida for a family vacation or to pick up the groceries with it. What it can do is help you feel good and look good. Feeling positive can have an amazing affect on your health and almost every other aspect of you life. That’s really the best part of wearing a great piece of jewellery. This 18 inch nautical link necklace is in like new condition showing no wear of any kind. At 24 inches in length it will fit even the largest gentleman with room to spare. We could take 7 inches out and make a bracelet for the lady who wants a matching set. You’ll appreciate the quality once you feel the heft of the solid link construction. Suitable for use with any style of pendant or it can be worn alone. Secured by a large and easy to use lobster clasp. Estate priced at $1800.00 CAD. Stock #e11425. Canada’s premier luxury jewellery chain BIRKS have never been known as a brand to push the design envelope. For well over 100 years they’ve produced high quality designs that were somewhat conservative and always thoughtful. Maybe in the 1970s these funky cufflinks were just an artistic jewellery expression of the times. Looking back today I’d consider them quite progressive for a Canadian company like BIRKS even in the context of the funky 70s. The vintage look is back and these cufflinks have that unmistakable vintage flair. These large 19mm x 19mm cufflinks are ultra cool. 100% Canadian made. The fronts are constructed from a calculated 15.9 grams of 10 karat yellow gold, while the 12 karat gold filled spring loaded “T” bar backs were made by Cadman Jewellery in small town Courtland Ontario. 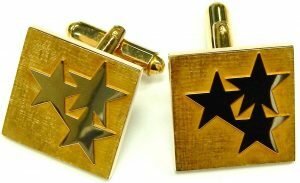 The cufflinks are embossed with a flat textured linen surface and those 3 highly polished geometric stars. They appear to pop from the background with a perfectly flat surface that acts like a golden mirror. 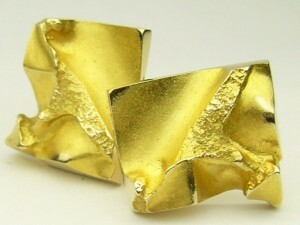 The contrasting finish is an excellent example what makes gold such a versatile precious metal. Excellent condition, looking like brand new with sharp crisp edges and no signs of wear and tear. If you’ve got a few French cuff shirts at home that just don’t get worn enough, turn them up a notch with these 70s vibe cufflinks. Total weight 20.3 grams. Estate price $980.00 CAD. Stock #e10453. There is no better choice gem for a gents ring than a diamond. They are incredibly hard, extremely tough and don’t require any special care or need to be worn with caution. Thanks to some advanced treatments you can even have their colour permanently altered. The natural 0.40 carat SI clarity diamond in this ring has been treated to show a dark slightly greenish blue colour. Enhanced coloured diamonds offer an inexpensive way to get a splash of contrasting colour in a ring without having to be careful wearing it. Diamonds are 200 times harder than the second hardest gem and even when they have been permanently coloured they still have the dispersion and brilliance that diamonds are prized for. 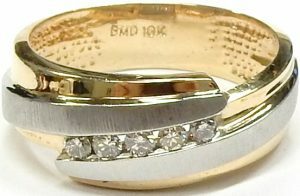 This 11.6 gram 14 karat yellow and white gold ring also contains 2 smaller 0.065ct. I1-G Gypsy set white diamonds in the shoulders. 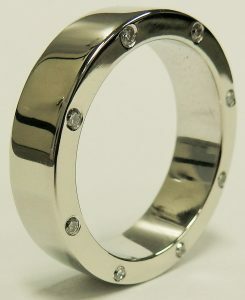 The low profile 8.8mm wide size 10.5 ring could be used as a wedding ring or right hand ring. Very good condition showing just the slightest evidence of wear. Original white rhodium plating is still on shoulders. Bill LeBoeuf Jewellers on staff goldsmiths can alter the size for free with purchase in a day or so. Estate priced at $2100.00. Stock #e9267. Getting married soon or maybe you just want a new look compared to that traditional yellow gold wedding band you’ve been wearing for so many years. 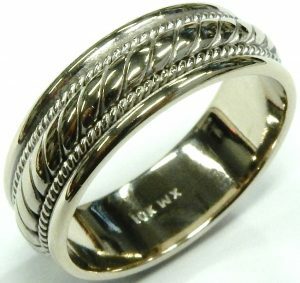 This Canadian made wedding ring is very attractive with a rope pattern centre section and milgrained/polished edges. At a time when so many Canadian jewellery manufacturers are leaving the country in favor of lower cost wage centres, it’s nice to know this ring was made here. Canada still has several high end wedding ring suppliers producing their products in Canada. Their quality and prices are as good as any made anywhere. Crown and Malo are two Canadian wedding ring suppliers that Bill Le Boeuf Jewellers is proud to represent in the Barrie area. Our rope style 7mm, size 9 example is in perfect condition and was made by Malo in Montreal. The ring looks like new and weighs 6.4 grams. Estate priced at only $350.00 CAD. Stock #e10755. Solid construction and made in Italy are just what you want to hear when you’re looking for a gold chain. This necklace measures 22 1/2 inches in length, 5.8mm wide and weighs over one troy ounce. 31.6 grams of Italian gold made by one of the countries best manufacturers UnoAerre. The double curb link style is a bit different than what you normally encounter. Perfect condition showing no wear in any of the flexible links or clasp assembly. It’s more than heavy enough for any man or the woman who likes the large casual style. At under $35.00 per gram for UnoAerre Italian chain the value is unbeatable. The necklace is secured by a large and very secure lobster catch. Looking like new, freshly polished and estate priced at only $1,100.00 CAD. Stock #e11909. Why settle for a super lightweight 10 karat gold wedding ring or one of those cheap alternative metal wedding rings because the wedding has become a little more expensive than you expected. 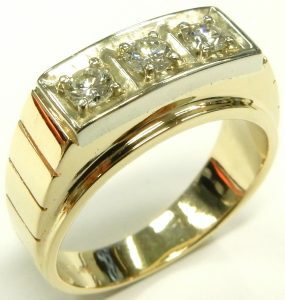 You can have a high quality, heavy weight 14 karat gold wedding ring for the same or less. 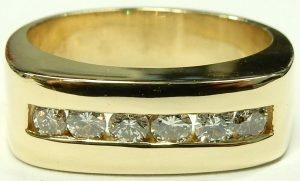 This solidly constructed estate wedding ring measures the most popular 6mm wide and is a finger size 10. The size can easily be adjusted up or down as required. 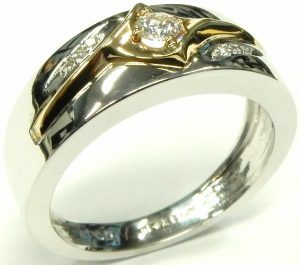 Yellow and white gold blend in a two tone design that has been a favorite combination for almost 100 years. Classic milgrain edging detail defines the different coloured gold sections. As trends and fashion changes a two tone design like this always compliments other jewellery and watches you may have. A comfort fit profile makes the ring so comfortable you won’t even notice you’re wearing it. If you’d prefer a softer more subtle look we can also finish the yellow gold centre section with a flat brushed texture. 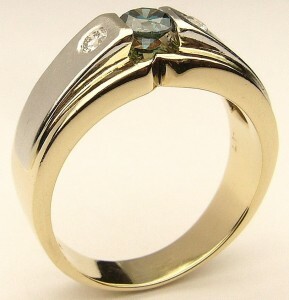 This excellent condition ring is estate priced at only $440.00 CAD. Stock #e10869. We have many other estate styles in stock that are not shown on our website. 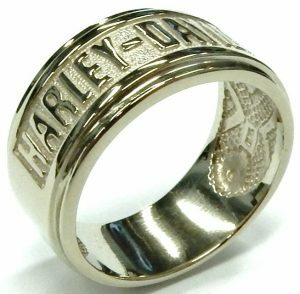 For the motorcycle enthusiast we offer this custom made Michael Smiley Fine Jewellery piece. The 16.3 gram 10 karat white and yellow gold ring has the high quality you’d expect from Michael Smiley but it’s certainly a deviation from his usual style. Measuring roughly finger size 10 1/4 this bike chain ring is probably the most comfortable ring you’ll ever wear. Unlike the real thing all the edges of this chain have been smoothed down for comfort. Add that to the rings ability to flex and bend with your finger and you’ll forget it’s even there. Estate price $1050.00 CAD. Stock #e10066. Considering the purely functional origins of the dog tag pendant it’s delightful to see how high it can be elevated in the hands of the right designer. The 21.4mm x 17.4mm soft edged rectangular tag has been skillfully inlaid with three strips of white gold. The results of which are a subtle contrast to the warm 18 karat yellow gold that makes up the rest of the tag. The over sized fluted bail measures 9.85mm x 5.30mm inside, with clearance for most any chain. 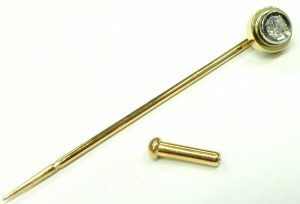 Leave it to the Italian masters to turn function into fashion with a white gold ball ended bar hinge. What could have been a simple connection joint is now a main feature of the pendant’s aesthetic. High polished and ready for a personalized engraving the 7.2 gram pendant would make a thoughtful, one of a kind gift. Estate price $560.00 CAD. Stock #e10937. You don’t encounter many hand made link bracelets, especially when that link is the iconic but readily available curb link style. I suppose the reason was due to a scarcity of 16mm wide curb links on the market. This rarely encountered size is certainly statement making! The one of a kind bracelet is made from 54.6 grams of 10 karat yellow gold, measures a long 8 3/4 inches, is secured with a safety catch and additional safety chain. Estate price $2,100.00 CAD. Stock #e11673. A ring made for a man who won’t compromise on quality! This super modern, smoothly geometric ring has been made from an impressive 8.5 grams of top quality 18 karat white gold. Fitting, as it’s been set with 0.50 carats of very well cut top quality VS-GH round brilliant cut diamonds; a quality combination usually encountered mostly from high end brands and stores like Tiffany. Many manufacturers don’t bother putting this much quality into their smaller diamonds and they certainly don’t spend them on men’s rings. An unfortunate shutout since most of the men we deal with care more about the Four C’s of diamond quality than the women they’re shopping for. After so much time researching quality for engagement rings men know what to look for when it comes time to shop for themselves. Which is why we are always excited to offer a gents ring of the same high quality that we demand for our female customers. This uncompromising example currently measures a finger size 12 with limited room to adjust. Estate price $1,500.00 CAD. Stock #e11317. Solid construction and never worn. One of the most popular styles for necklaces and bracelets is the Figaro link design. This bracelet takes the design a step further with a beveled edge and concave profile centre section. The beveled edge gives it some twinkle and the concave middle saves some weight while resisting scratches. The 18 karat plate finish gives the domestically made solid 10 karat gold a distinctly rich imported 18 karat Italian look for 1/2 the price. This never worn bracelet still displays sharp crisp edges and only extremely minor evidence of shop wear. The bracelet is secured by a large heavy duty lobster clasp. 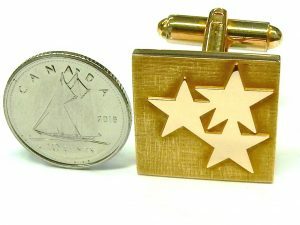 8 1/2 inches long, 8.5mm wide, weighing 17.4 grams and estate priced at only $770.00 CAD. Stock #e11585. Solid link chains are far easier to manufacture and last many times longer compared to ultra light weight hollow chain but you almost never see them. 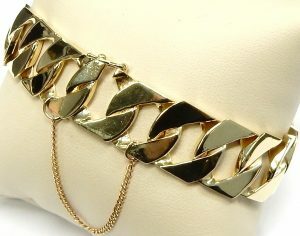 Everyone loves the look of a thick heavy necklace but almost no one is willing to pay the price. 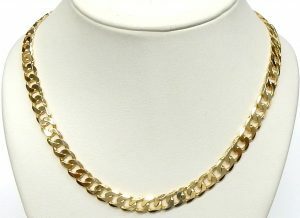 This estate 25 inch chain is in perfect condition and doesn’t cost much more than a hollow version but offers waaaaay better value and will last for decades. No worries about crushing fragile hollow tubes with this one as it weighs almost 3/4 of an ounce. The gold value in the chain alone is $684.00 with gold priced at $1600.00 per oz. CAD. The long length and substantial weight make it suitable for men or woman. Estate priced at $1,050.00 CAD. Stock #e11663. After 60 years in the same downtown location it’s probably fair to accuse us of the occasional lapse of nostalgia. When Bill opened his store in 1958 tie tacs were still a part of a professional man’s daily wardrobe. The diamond tie tac Adam wears was worn regularly by Bill as he labored away building his business from the ground up. 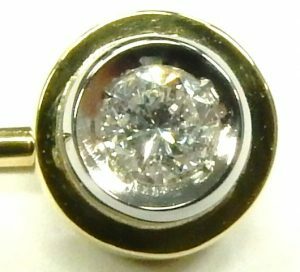 So it’s no leap of the imagination to understand why we are featuring this high quality 18 karat white and yellow gold diamond tie tac today. The understated accent is more than just a fashion statement, keeping the tie tidy in any situation. Our 2.2 gram example is very well made with a protective bezel around its 0.12 carat SI-H round brilliant cut diamond center. The 1.7 inch long pin is made from sturdy 1.2mm gauge 18 karat gold wire with an ingenious locking cap for added comfort and security. The estate price for the like new pin $350.00 CAD. Stock #e10939. Here’s a great gift idea for the guy who has almost everything. Harleys are usually decked out in all kinds of shiny chrome parts and amazing paint jobs so it’s only fitting that the rider/owner has some biker bling too. This ring has been well made from over 7.7 grams of tough 10 karat white gold. It measures 10mm wide in a slightly smaller than average size of 7. As is it will likely fit the smaller man’s pinky finger perfectly. We can easily make it multiple sizes bigger to fit almost anyone’s finger. Estate priced at $441.00. Stock #e10777. Gold isn’t $500.00 anymore and buying something like this brand new can get pretty costly. The great thing about estate jewellery is that it doesn’t know it’s been previously enjoyed. 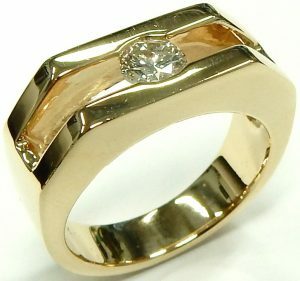 We can also usually refinish and refurbish gold jewellery to look as good as the day it was first delivered. 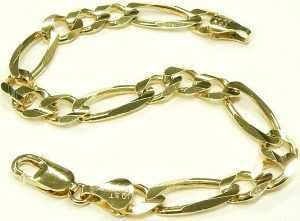 This Italian made curb link chain was likely made in an era when the price of gold wasn’t anywhere near the $1730.00 per ounce Canadian it currently trades at. Solid links, upgraded 14 karat construction and a generous finished weight of over 1 troy ounce make for a luxurious look and feel. 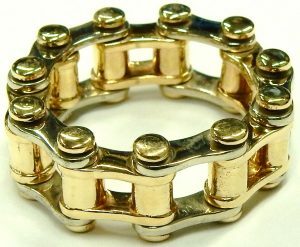 Any bracelet made from lesser quality gold with light, hollow and weak links just won’t cut it after you’ve tried this one on. At 9 inches total length this bracelet will fit all but the largest of gentlemen. The total width of 8mm could easily be worn by a lady too if we shorten the length a bit. Lightly polished and looking like new the excellent condition bracelet is estate priced at $1,740.00 CAD. Stock #e11057. This time of year I’m sure you’re getting lots of flyers and brochures from local jewellery stores promoting big sales. I see them too but I haven’t seen one yet that gives enough detail to determine if any of the offerings represent decent value. The jewellery looks great and is very pretty but disclosure of quality, weight or certification standards are seldom (almost never) given. At Bill Le Boeuf Jewellers we ALWAYS show you everything you need to know in order to determine the fantastic value of our estate items offerings. 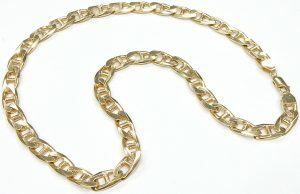 This gents 23 inch nautical link 10 karat yellow gold chain weighs 97 grams (well over 3 full ounces). From this information alone it’s easy to see we offer value that few can come close to matching. If you call other jewellers asking how much the chain weighs in their flyer, they’re likely going to say, “I’m sorry but we don’t sell our chain by weight”. Well they may not sell by the weight but I guarantee they buy it by weight. 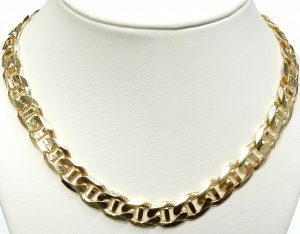 This nautical link chain is in excellent original condition showing no wear between the solid 10mm wide links. We’ve decided to leave it unpolished and original. We’ll, happily refinish it while you wait in approximately 20 minutes. The refinishing process is likely to remove about 1/2 a gram of gold but the necklace will look like new. Heavy chains like this don’t come in very often. If you’ve been looking around for one don’t wait too long. We don’t send out flyers at Bill Le Boeuf Jewellers; our true value merchandise can be seen on the pages of our website or in person at our one and only location since 1958. This necklace is estate priced at $3,025.00 CAD. Stock #e11784. An interesting jewellery item for the man who has everything. 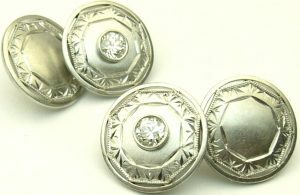 Art Deco design platinum disc cufflinks. Each side contains one 0.20 carat European cut diamond of very good VS-HI quality. The circular cufflinks measure approximately 13.5mm diameter with a pierced mill grain and hand engraved decorative border. The platinum discs are connected by a 3 link 18 karat white gold chain. The pair dates from the 1920s, weighs 10.6 grams and are estate priced at $1,400.00. Stock #e7765. 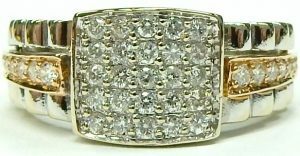 Excellent condition gents yellow and white gold diamond ring. The size 9 ring weighs 4.4 grams and contains 5 round brilliant cut diamonds of SI clarity averaging a colour grade of K. Never polished or refinished, still showing the original rhodium brushed channels on top. This ring would make an interesting alternative to a traditional wedding band on a right hand ring. Originally purchased at Ben Moss Jewellers Canada. Estate priced at only $420.00 CAD. Stock #e11696. When it comes to jewellery, men are usually quite conservative in their selections. A plain wedding ring, maybe a gold chain or bracelet and that’s about it. Strange really because when it comes to shiny products like luxury cars, boats, expensive watches etcetera, men are by far the number one market. Cufflinks offer an interesting option for the gentleman who goes to the occasional formal event or someone who likes the tailored look of French cuff shirts. This pair goes well beyond the typical sterling silver or gold plated accessory you’d find at the checkout of a fine haberdasher. There is little doubt these are a custom commissioned item made by a highly skilled jeweller. From the generous 15.9 gram finished weight of premium 18 karat white gold construction, to the very high quality royal blue sapphires and beautiful white diamonds, this is a set that wasn’t defined by a limited budget. 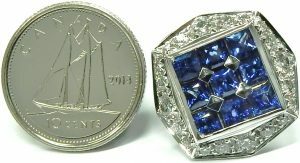 The 18 square faceted sapphires are estimated to weight 4.50 carats in total. As soon as you see the brilliant bright blue colour you know you are seeing what high quality sapphires should look like. They’re arranged in a tightly set black rhodium enhanced square. The octagonal outline frame has been bead set with 40 round brilliant cut diamonds of SI-G quality that are estimated to weigh 1.00 carat in total weight. Condition could be best described as looking unworn. They were given to a gentleman as a presentation gift in recognition of many years of service work. After the original owner sold them to Bill Le Boeuf Jewellers he donated the proceeds to charity and continued his service work. 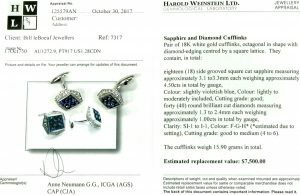 The earrings come with a current October 2017 certificate of appraisal from Toronto jewellery appraisal service company Harold Weinstein Ltd. This certificate should enable you (if you choose) to insure this special pair of cufflinks under any household insurance policy. They represent an excellent value at the estate price of $4500.00 CAD. Stock #e10825. Do your homework and learn for yourself that estate jewellery from Bill Le Boeuf Jewellers offers better value than anywhere. 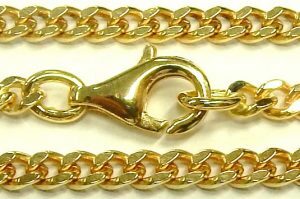 For under $900.00 this perfect condition nautical link gents chain is priced under its wholesale replacement cost. If you have a large neck you may find the 20 1/2 inch length a little short. If you are of average size this necklace should fit perfectly, just visible with the second button undone on a shirt. It measures 6.7mm wide as compared to this standard size 7.0mm pencil. Previously used but showing absolutely no wear in any of the joints. It is equipped with a large lobster clasp and soldered shut connecting ring. Have a look at your gold necklaces and see if the connecting ring is soldered permanently closed. Many times to save a few dollars manufacturers elect to only pinch them closed. It may not seem like a big deal but it’s nice to know a little more time, effort and expense has gone in to making this heavy (26.6 gram) chain as secure as possible. Estate priced at only $898.00 CAD. Stock #e11225. Heavy gauge construction in upgraded 14 karat gold with just a little bling. With gold prices close to $1700.00 Canadian per ounce you don’t see many rings built like this in the displays of jewellers. Almost all diamond gents rings taper and thin at the shoulders to the bottom of the shank, just where you need the strength. I assume this ring was a special order for someone who appreciated quality construction and was wiling to pay for it. 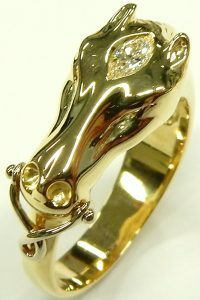 Most production rings of this design weigh half of what this one does and are usually only 10 karat gold. Securely channel set across the top of the ring are 6 round brilliant cut diamonds of I1-KL quality offering a classy and subtle touch of bling. No worries about compromising the strength if you are not a size 9 1/4, we can make the ring bigger or smaller without concern. Just a plain wedding ring without any diamonds of this weight would cost at least $1000.00. 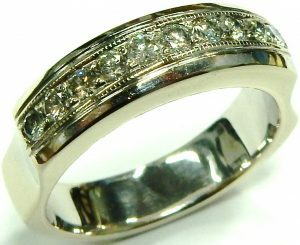 This ring is in excellent condition and estate priced at $1,020.00 CAD. Stock #e11042. 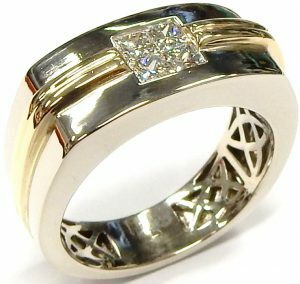 For those men who appreciate quality jewellery and traditional design, here is a nice diamond ring that could be used as an alternative wedding ring, right hand ring or pinky ring if you’ve got large hands. 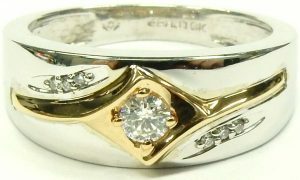 The 14 karat yellow and white gold setting contains 3 low set round brilliant cut diamonds of very nice VS-I quality. The comfortable fitting, solid back constructed ring weighs a substantial 9.1 grams in its current finger size 9 1/2. For those men who think diamonds are feminine consider where the name “diamond” comes from. Its origins can be traced to the Greek word adamas that translates to unconquerable. This describes diamonds ability to overcome all attempts to cut or polish the gem from the technology available to ancient craftsmen. This most frustrating of all gems was originally only worn by men as a symbol of masculinity due to the durability diamonds offered. This ring is freshly polished and looking like new. Including a complimentary size adjustment the ring is estate priced at just $1400.00 CAD. Stock #e10731. 14kt. 32.3gr. 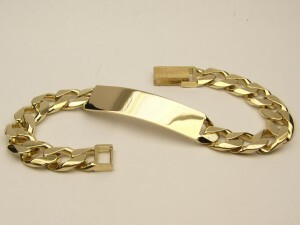 gents curb link bracelet 9.5 inches $1960.00 CAD. Finally, a bracelet made for the large wristed man. Measuring 9 1/2 inches long this bracelet is sure to fit all but the largest wrist sized gentleman. Most gents bracelets are usually made to around 8 1/2 inches in length. The super strong, solid curb link is ideal for daily wear weighing in at a hulking 32.3 grams. Manufactured from high quality 14 yellow gold this bracelet is design to last a very long time. The 8.8mm wide bracelet is secured with a G lock clasp for easy, one handed application. Excellent condition showing no worn or damaged links. Estate price $1960.00 CAD. Stock #e10170. Now here’s a beast of a bracelet for you! It weighs a surprising 88.4 grams. Surprising because it doesn’t look like it should weigh this much but Platinum is the second densest element on the periodic table and is denser than iron, gold, and tungsten. This density means that one solid link of the bracelet, if made from solid steel or solid 18 karat gold, would weigh far less even if all dimensions were exactly the same. The bright white platinum is complimented with beautiful warm colour 18 karat gold making for a very modern and versatile men’s look. 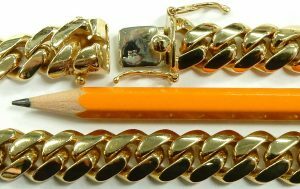 Measuring 9 inches long with a very well made, super secure 18 karat yellow gold figure eight lobster clasp this hefty bracelet is ready for anything. Estate price $4950.00 CAD. Stock #e9769. Longevity, efficiency, knowledge plus a profound respect for our clients allows us, and motivates us to offer some amazing values on our new and estate jewellery. Very few jewellers give you all the information necessary to make a logical decision on your potential purchase; fewer still give it to you online. We WANT you to compare our products with any and all other offerings. This chain is imported from Italy and manufactured by UnoAerre. They are one of the finest chain and jewellery producers in the world. It measures 22 inches in length and 4.8mm wide. 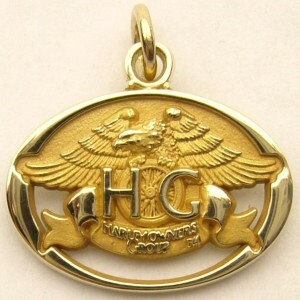 Made from 22.8 grams of premium 18 karat (75% purity) yellow gold. It is secured by a large lobster style clasp that’s easy to use and very safe. The final piece of the value equation that’s often omitted from virtually every other jewellery store website, the weight. At 23.1 grams in weight this chain contains over 1/2 an ounce of pure gold valued at over $900.00 CAD at the current gold price ($1641.00 CAD). We won’t try to manipulate your decision with an inflated and optimistic insurance appraisal because of our respect for our customers best interests. The chain is in very good condition and was only occasionally worn by the previous owner. Call around or shop around; for just $1250.00 we’re sure you will not find better value. Stock #e11441. The nautical or marine link chain follows the same link style as the curb, allowing it to sit flat while being worn. Subdividing that traditional link with a small gold bar changes the impression of the chain, making it look like a continuous, uninterrupted strand of gold. That slight adjustment makes the 20 inch long 14 karat yellow gold chain look much heavier than its 13.2 gram weight would suggest. 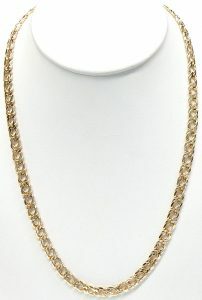 Equipped with stylized end caps and strong lobster clasp the chain is estate priced at $840.00 CAD. Stock #e10037. From Russia with love comes this 14 karat rose gold gents wedding ring. In North America we measure gold purity as a fraction of 24 parts, 24 karat gold is pure, 18 karat gold is 75% pure, 10 karat gold is 41.7% pure etc. In many countries gold purity is measured in a more logical method in percentage of purity. 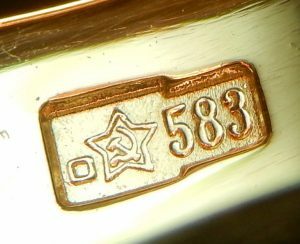 In the case of this Russian ring 583 equals 58.3% pure or the equivalent of our 14 karat (14÷24=0.583). This ring measures a comfortable 4.4mm wide and slightly larger size 11 3/4. One of our goldsmiths can easily make it smaller to fit the average gentleman’s finger. If you had questions about the eastern European origin, one look at the crystal clear hallmark will leave little doubt where it was made. The ring has been polished up like new and is ready to go. At 4.2 grams it’s not the heaviest ring available but because it is alloyed with a little more copper compared to traditional 14 karat yellow gold it is harder. The copper also gives it a lovely rose hue. These don’t show up very often, so if you like it don’t wait around. For just $266.00 it represents excellent value. Stock #e11473. This heavy gents ring came to us from a Canadian soldier who sold us a couple of pieces. He purchased it while on tour but never ended up wearing it. According to him it was purchased overseas in the Middle East which explains the warm 18 karat yellow gold colour. In many eastern cultures rich traditional gold tones are the norm but North American tastes tend toward paler more alloyed karat gold colours. None the less this never worn ring fits nicely into men’s style trends with a bezel set 0.17 carat square brilliant cut VS quality diamond setting off the geometric motif of the ring. 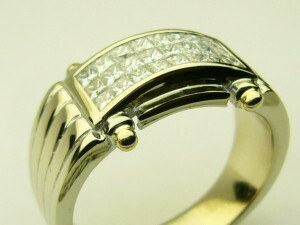 The diamond is a K colour but thanks to the yellow gold on either side it ends up looking nice and white. The ring is built strong with no hollowed out areas, it weighs a substantial 10.8 grams and currently measures a size 10 but can easily be adjusted up or down a couple sizes. Estate price $1540.00 CAD. Stock #e9624. Weighing over 2 ounces this is a heavy piece of jewellery. The traditional rope link necklace measures 24 inches long but it’s the diameter that’s most impressive. At 10mm wide it really makes an impression. The extra feature of a white gold box link chain wrapped around the middle of the entire length gives this chain a little more “bling”, not that this item needed any more of that. Like new condition, never been polished or refinished in any way. The plunger type catch with side safety clasp are working as designed and offer a secure connection. 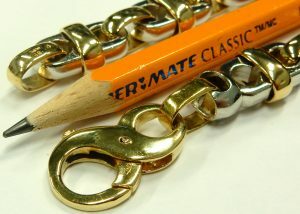 The 67 gram chain is pictured beside a standard pencil to give you an idea of the scale of this piece. Estate price $3700.00 CAD. Stock #e10035. Sure you’ve seen oversized statement chains on celebrities and athletes before. They’ve been popular long before Mr. T. Maybe they’re not for you but I don’t think you can fully understand the draw behind these monster chains until you’ve tried one on. 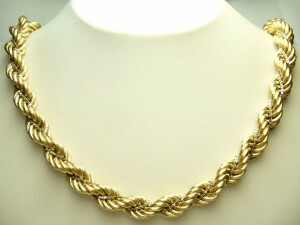 The look and feel of a substantial gold necklace definitely has a mysterious attraction. Fasten this Miami Cuban around your neck and you’ll instantly shrink two inches. Weighing in at 204.2 grams (almost 1/2 a pound) this is without a doubt the most substantial chain we’ve ever encountered. Honestly you may need a note from your chiropractor if you intend to wear this daily. 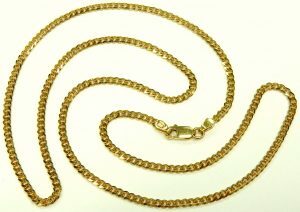 At 24 inches long and 11.5mm wide this 10 karat yellow gold chain was made to be seen (even at a distance) and it’s in perfect condition. Equipped with a super secure hand made box catch with two additional safety locks, probably because they just don’t make lobster catches this size. Estate price for this once in a lifetime chain $7273.00 CAD. Stock #e11353. The foxtail chain is the modern take on medieval woven chains, carrying their traditional durability and brute strength. In the medieval era these woven chains were made by hand, soldering thousands of oval links together and painstakingly weaving them into each other. Finally after hours of careful work the chain would be soldered to a heavy post and drawn through descending holes drilled into a thick hardwood plate. This process would tighten up the weave, unifying the look of each link, and bring the chain to its final, wearable length. It would also expose weak joints in any of the links, as the weak soldered seams would snap under pressure; ruining the chain and hours upon hours of work. Chains that survived this process would be finished with a hand made clasp with decorative end caps, usually adorned with precious gems. Thankfully manufacturing processes have mechanized most of the work, allowing woven chains to be available to people outside of the monarchy. 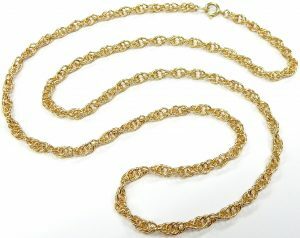 This 24 inch long foxtail chain was made in Turkey from 26.1 grams of warm 14 karat yellow gold. The durable link has been finished with heavy end caps and a secure lobster clasp all of which show no sign of wear. In brand new condition with the estate price of $1620.00 CAD. Stock #e9868. There are very few 18 karat gents gold bracelets passing through our estate department. Most are 10 karat with the occasional 14 karat mixed in, but they are almost never 18 karat. When you get into bracelets that are as substantial as this 11mm wide x 2mm thick flattened curb link style the price really sores if you’re considering something like this brand new. This estate example weighs in at a hefty 29 grams. The 8 inch long bracelet should fit the average to slightly bigger gentleman’s wrist. Secured by a tight, custom made box catch and curved safety for added peace of mind. Excellent condition showing no wear between any of the 23 highly polished links. Estate price $2310.00 CAD. Stock #e10144. Most people don’t realize just how heavy gold really is. Usually it gets diluted down to 10 or 14 karat then made into hollow flimsy jewellery. With gold priced at well over $1700.00 Canadian per ounce I understand the motivation. That’s why it’s so nice to see what can be made when price isn’t the main concern. This necklace was made without the usual budgetary constraints. It’s one thing to make a solid link chain in 10 karat gold but quite another to do it in 18 karat! Premium 18 karat gold is around 35% heavier and almost twice as costly. 18 karat gold has a much more attractive rich yellow colour and is far more resistant to corrosion. At first consideration perhaps resistance to corrosion and chemical attack isn’t at the top of your shopping list, but it’s something that should be kept in mind for a chain with this many assembled components. Perspiration, perfumes, aftershaves, soaps and chemicals you may encounter in swimming pools and hot tubs can attack the solder joints over time causing them to corrode and eventually fail. 18 karat yellow gold is many times more resistant and therefore much longer lasting than other lesser gold alloys. This chain measures 7.0mm wide and 26 inches in total length. The necklace was manufactured without a clasp. We can easily add a sturdy clasp or we could remove a section to shorten it and make a matching bracelet with the leftover. It is in excellent condition showing no wear in any of the links. As a point of interest; with gold priced at $1735.00 CAD this chain contains $3400.00 worth of just recyclable gold. The necklace is estate priced at $5475.00 CAD. Stock #e11063. Just the facts please. 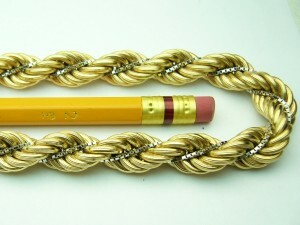 10 karat, 8.25 inches long, 8.8mm wide, made in Italy, 21.4 grams. Great shape with no worn links. Will fit a smaller size men’s wrist or can be shortened to fit the smallest ladies arm. Estate priced at $780.00. With just the facts I’m sure you can see the great value this item offers. One other thing to consider, the gold value alone in this bracelet is worth $436.00 with gold priced at $1522.00 CAD per ounce. Stock #e9192. Nice and simple but all about quality. There is no substitute for the feel and look of 18 karat yellow gold. Once you’ve experienced the luxury of high purity precious metal you’ll never consider anything else. Sometimes a little taste of high quality is worse than none at all because now you know what you were missing. 23 grams of 75% purity and 27 inches in length will fit even the biggest man. With or without a pendant this beautiful chain looks complete. Higher karat of gold is far more resistant to corrosion and oxidation. Each of the 300 plus individual links is this chain have been soldered shut ensuring strength. The last thing you want to happen is have those solder joints compromised from corrosion by salt water, sweat etc. that lower karat chain is prone to. The quality of an 18 karat piece will endure long after you forgot what the premium quality cost. This chain is in like new condition showing no worn links. Estate priced at $1800.00 CAD. Stock #e9865. 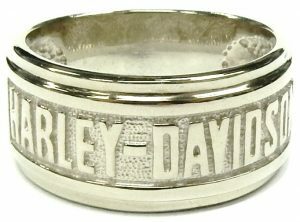 Typically a good quality men’s ring weighs around 7 grams and they are usually manufactured from 10 or 14 karat. This one is at least 3 times the average weight and was hand crafted from premium 18 karat yellow gold and super white platinum. 10 high quality VS-H diamonds circle the circumference adding just a little twinkle no matter which way the ring is facing. This ring was custom made in Canada by long time, upscale Toronto manufacturer Platinum Unlimited. Despite the overachieving weight of 22.5 grams the ring is super comfy. The uniform width of just under 10mm distributes the weight evenly around the entire ring and the gently rounded inside edges help to slide the ring over your knuckle. 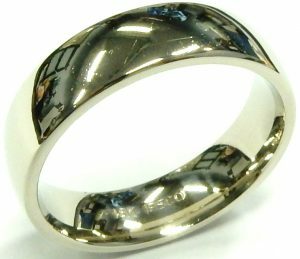 Made in the average gentleman’s finger size 10 this ring would make an impressive wedding ring or it could be a right hand ring. Highly polished 18 karat edges contrast the brushed platinum centre section in a manner very complimentary to many two tone watches. You’ll not see a ring of this quality from any off the shelf jeweller. Bill Le Boeuf Jewellers is not your typical jewellery store. We have 1000s of unique estate and new items for you to consider. If you have a size 10 finger you really should come in and try it on. You’ll never regret buying quality. 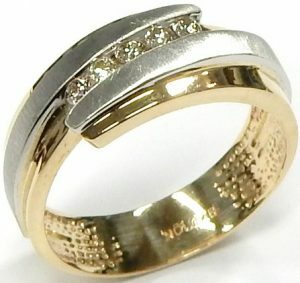 This ring is estate priced at $1520.00 CAD. Stock #e11078. We often have men looking for alternative metal wedding bands because they work with their hands and want something tough that will last. Then we get into a lengthy discussion about the short comings of alternative metal wedding bands. First of all they can’t be efficiently sized or sized at all, so when “dad bod” takes effect later in life you’ll need to buy a new ring. Second they can’t be refinished effectively; we can remove minor scratches but if you gouge it deeply that mark is there forever. Third, to remove these rings in an emergency situation can get a little difficult. We use steel cutting wheels to cut rings off of people’s finger so if you choose a cobalt, tungsten, titanium etc. our tools can’t cut through it. Now if you go the tungsten, cobalt or ceramic route the rings can be compressed until they shatter but then all you can do is throw the broken pieces away. That’s when we suggest rings like this 6.0mm wide by 2.5mm thick 12.5 gram 14 karat white gold ring. 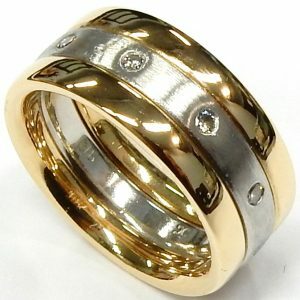 These thick gold wedding bands are perfect for men who work with their hands. They can be sized, refinished, and cut off in emergencies. They’re made so substantial they are much less prone to cracking or bending while being worn. This particular band also comes with 0.20 carat total weight of nice SI-H diamonds set deeply into its sides adding some subtle bling in a really unique way. In a finger size 9 ½ the band can be sized up or down a couple of sizes and can easily be given a brushed finish for an even more subtle look. Estate price $997.50 CAD. Stock #e9493. We don’t see too many gents diamond rings come through our estate department and I think this is the first example to showcase a Canadian diamond. Not only is it a Canadian diamond, the ring is also brand new. The size 10 1/2 ring is in perfect condition without a scuff or scratch on the original factory rhodium finish. The centre diamond is a good looking, bright I1-H quality. It’s flanked by 6 small highlight diamonds bead set down the shoulders. Manufactured in mostly white gold showing just enough yellow gold to nicely match many two tone watches. This ring could be used as a wedding ring or a right hand dress ring for date night. The 0.16 carat diamond has been laser engraved with a unique registered number documenting the Canadian origin. Our onsite goldsmiths can adjust the 7.3 gram ring up or down a few sizes in only a few days if required. Modern contemporary design and estate priced at just $560.00 CAD. Stock #e10746. Ever notice those glossy, slick jewellery store flyers you get delivered in your newspaper? If your looking at our website I’m sure you at least occasionally thumb through them. I guarantee that if they show a simple chain necklace or bracelet like this they’ll not provide a crucial bit of information, THE WEIGHT!!! They may say things like heavy, thick, large and that it’s on sale at 30, 40, 50% off or more but all this tells you absolutely nothing. We don’t play numbers games at Bill Le Boeuf Jewellers or misguide our valued customers with misleading phony discounts. We simply give you all the information you need to make an informed decision of where to find the best value. And here it is. 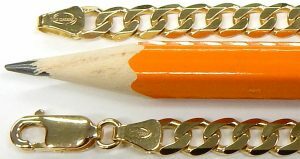 Gents 10 karat yellow gold reversible curb link bracelet, 8 1/2 inches long, weighing over 22 grams. It’s in great shape ready to wear secured by a monster oversized lobster clasp. Don’t be fooled by deceptive marketing strategies. “Price is simply what you pay, Value is what you get” at Bill Le Boeuf Jewellers. Estate priced at just $870.00 CAD. Stock #e10392. This is a fairly heavy ring weighing over 12 grams and measuring a finger size 9.5. This ring was made in Toronto by Mirage jewellers who specialize in the difficult technique of invisibly setting princess cut diamonds. 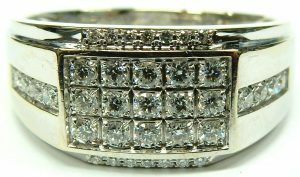 The 24 princess cut diamonds in this ring are of very good VS-G quality and weigh a combined 1.00 carat. A couple of the diamonds have their corners chipped. The minor chips don’t take away from the beauty of the ring but we have adjusted the price accordingly. This ring comes with an appraisal from Harold Weinstein Ltd. dated Dec 2001. Estate priced at $2100.00 CAD. Stock #e7749. 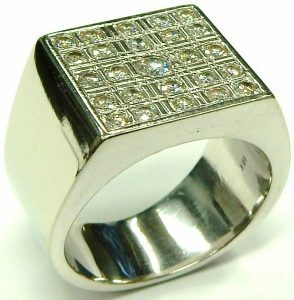 It’s been awhile since we posted a gents diamond ring; here’s a nice quality, contemporary design to consider. Made from over 7.6 grams of 18 karat white and yellow gold manufactured in a style resembling the president bracelet on a Rolex Day-Date watch. The size 10 ring has been assembled from three separate castings of yellow and white gold. 39 bright white round brilliant cut diamonds of I1-I quality have been bead set in in the 10mm x 11mm cushion shaped setting and along the shoulders. The modern style can’t be more than a few years old and is in excellent condition. A quick, complimentary size adjustment and rhodium plating is all that is required to make the ring look like new. Estate priced at only $1330.00 CAD. Stock #e10955. There’s a long standing tradition for those getting married. 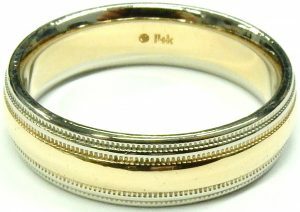 The gold wedding band has been a symbol of commitment between couples for well over 1000 years. A plain wedding ring with no specific top or bottom has always been the most popular. The wedding band is an endless, eternal sign of commitment and devotion. Gold has always been the metal of choice. It’s durable, precious and rare, befitting the meaningful bond between two people. Only recently have new alternative metals and materials been offered. Now you can choose titanium, cobalt, tungsten carbide, ceramic, stainless steel and even rubber/silicon. While these substitutes are fun they really are just substitutes of the real thing. Many of the exotic metals and alloys can never be sized and cutting them off is also impossible. There’s nothing quite like a nice high quality wedding ring, they feel great and never go out of style. 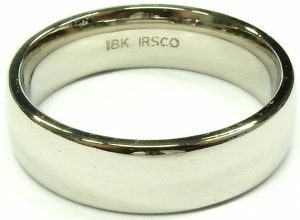 This estate gents wedding ring was made in Canada by Imperial Refining and Smelting Co. Its basic low convex profile represents one of the most popular combinations of upgraded 18 karat white gold, 6mm in width, finger size 9 1/2 with a comfort fit. It weighs just under 10 grams and can be adjusted in size up or down a little. 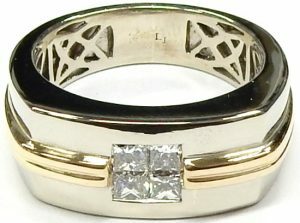 You can buy many alternative wedding rings for $660.00 but all have practically zero intrinsic value. 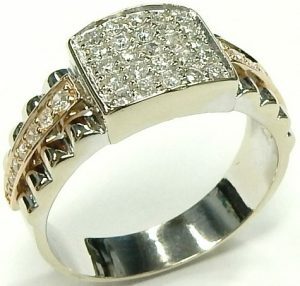 The gold value alone in this ring is approaching $400.00 with gold priced at $1600.00 per ounce Canadian. If you wish we can engrave a special message inside or an important date. 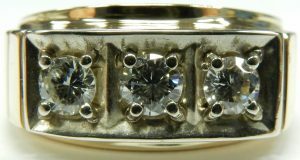 In like new condition the ring is estate priced at $660.00 CAD. Stock #e10786. 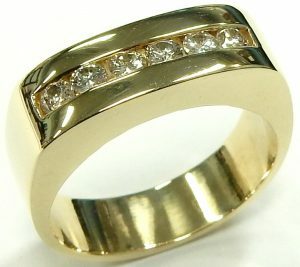 It’s true most rings that we show are ladies but sometimes really classic men’s styles show up. Here is a timeless design made by BIRKS. It’s hard to say how old it is because this style is still in production today by many manufactures. The cushion shaped black onyx is in perfect condition not showing any scuffs or scratches. A small bezel set 0.10 carat in the centre twinkles like a star in a midnight sky. The ring is made from over 10 grams of highly polished 14 karat yellow gold. Measuring a size 10.5 this ring would fit the average man’s ring finger but can be sized up or down as required. Estate priced at $1050.00 CAD. Stock #e6943. Nothing beats custom made jewellery; without it you would never find a gents ring made from more than an ounce (34 grams to be exact) of 14 karat white gold! If its weight isn’t enough to impress you the ring measures a staggering 16mm wide, taking up nearly an entire digit. 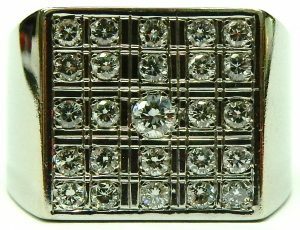 Its square top is made even more geometric looking with the bracketing pattern that separates the 25 diamonds it holds. That pattern flashes a mellow contrast to the 0.94 carats of lively VS-HI quality round brilliant cuts (one of which has a minor chip). The solid ring currently measures a finger size 11 with room to adjust, though our onsite goldsmiths will break a sweat trying to bend that heavy shank! Estate price $2400.00 CAD. Stock #e9443. I really don’t know why this style of necklace is called a cable link. It doesn’t look like a cable, but that’s a discussion for another day. What I do know for sure is that purchasing a perfect condition estate chain like this makes way more sense than buying a brand new one for twice the money. For less than the price of a new 10 karat version you can have an Italian made 18 karat chain. Did you know that when you’re buying 10 karat gold you’re actually buying more silver than gold, as the gold content in 10 karat is less than 42%. In 18 karat gold you get 75% pure gold. Higher gold content is much prettier, heavier and far more resistant to corrosion. Corrosion is the biggest cause of chains that mysteriously break. The links in every chain manufactured should be soldered shut. Low karat gold chain is held together with low karat solder. Low karat solder just doesn’t stand up to something that’s worn 24/7 like a necklace. For overall durability there is no question 18 karat is the way to go. This example was made in Vicenza Italy. It measures 24 inches in length, weighs 8.2 grams and is in perfect condition showing no signs of use. Estate priced at $600.00 CAD. Stock #e10458. The possible combinations of gold chain patterns seem almost endless. This design is a blend of two very popular styles. The Figaro link and nautical link come together in this 23 inch 10 karat yellow gold necklace suitable for either man or woman. 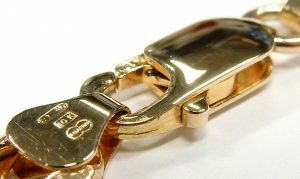 Secured by a sturdy lobster clasp the chain is in very good condition showing no measurable wear on any of the link ends. The bright cut bevelled edges catch the light with a flat reflective surface. At 11.6 grams the solid link construction is quite substantial but not heavy. Estate priced at $490.00 CAD. Stock #e10780. Standard, popular and durable design. The curb link bracelet is the obvious design choice when you want to make a linked bracelet lay flat. 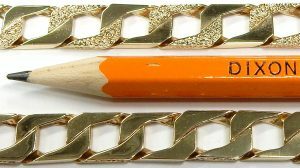 Measuring 7.5 inches long, made from 21.4 grams of 10 karat yellow gold the bracelet could be worn by a thinner gentleman or shortened and worn by a woman. The bark/polished pattern looks like new showing little wear of any kind. 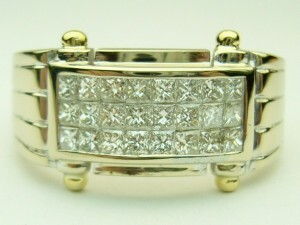 The other side has a diamond cut accent along with the polished sections making this bracelet reversible. Estate priced at $840.00 CAD. Stock #e7738. When it comes to jewellery design men usually prefer straight lines, symmetry and order. Larger scale, solid construction combined with high quality components are characteristics the guys always request. The problem with a wish list like this is sometimes the end product costs quite a bit more than anticipated. That’s where estate jewellery like this lets you have your cake and eat it too. Rarely do we see men’s jewellery better built than this. You’d never see something like this as a regular production item. The cost to produce such an item just wouldn’t make sense for most manufacturers. 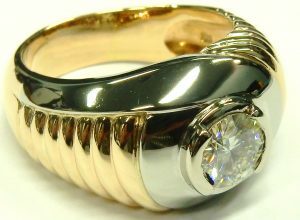 Luckily for you someone had this amazing ring custom commissioned a few years ago right here at Bill Le Boeuf Jewellers. It was traded in recently and now it’s ready for the next guy looking for a big ring with some serious bling. When it comes to premium brand men’s watches, stainless steel has been the preferred metal for sometime now. I suspect it’s mostly due to the fact a full sized gold Rolex, Breitling or Omega will run you over $30,000.00. For rings, chains and bracelets though, yellow gold has always been the favored metal. When it comes to yellow gold this ring has an abundance of rich precious 18 karat. Most gents rings are made from only 10 karat gold and usually weigh less than 10 grams; this ring weighs a hefty 34.9 grams! 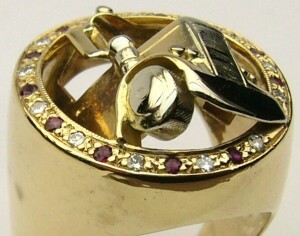 9 bezel set square brilliant cut diamonds are the focal point arranged in a tidy Tic Tac Toe pattern. 32 nice sized round single cut diamonds form the twinkling frame. The 41 diamonds are estimated to weigh 2.08 carats. It’s refreshing to see that diamond quality wasn’t compromised in order to produce this ring. All the diamonds are nicely matched of very good SI1-HI quality. 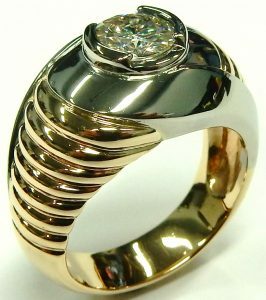 The ring is great example of what can be done with men’s jewellery when a tight budget isn’t the defining factor. If you have a larger than average finger size, the 18.5mm x 18.5mm size and solid construction will feel great. It’s in excellent overall condition showing very little wear. Estate priced at $4200.00 CAD. Stock #e10720. Maybe the man in your life IS a jewellery guy and he doesn’t even know it. Here’s a great way to test the water for very little money and still get a quality piece. This style has all the design points that most men are drawn to. Flat profile, flat edges, straight geometric patterns, combination brushed and polished textures with just a bit of bling. The ring is perfect in every way, never having been worn before. It measures the standard size 10 but it can easily be adjusted up or down as required. Securely bead set in a recessed, bright white rhodium setting is one small round brilliant cut diamond weighing 0.04 carats of nice I1-HI quality. Made from durable and hard 10 karat gold the ring has a finished weight of just under 5.5 grams. Brand new, never worn and estate priced at $315.00 CAD. If not suitable you can return it for a full refund. Stock #e10762. High quality gents wedding rings usually don’t exceed much more than 10 grams in weight, in fact most usually weigh around 7. Here’s a custom made gents ring that was designed without much regard given to the finished weight. Although it’s traditional flat edged design does resemble many contemporary wedding ring designs it could easily be worn on your right hand or pinky finger. Despite its more average finger size of 9 this ring weighs an attention grabbing 18.1 grams! It was constructed with lots of extra durable 10 karat white gold. It has a width of 7.8mm and a thickness of just shy of 3.5mm. In perfect condition the ring appears unworn. The scratch free, brushed and polished, bright white original rhodium finish is completely intact. It’s not just the overall weight of the ring that you notice, it’s also been set with 3 nice sized round brilliant cut diamonds totalling an estimated 1.01 carats. The centre diamond weighs approximately 0.53 carats and is of I1-H quality, with 2 well matched 0.24 carat I1-L round brilliant cut diamonds set on each shoulder. I suppose if you needed the ring adjusted in size it would be possible, but a ring of these robust dimensions would be quite difficult to change. The rounded comfort fit shank is a pleasure to wear if you’re a size 9. Brand new, never worn and estate priced at only $2450.00 CAD. Stock #e10747. 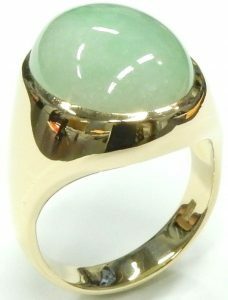 Precious jade (jadeite) might just be the best gem for a gents ring, maybe even better than diamond. Everyone knows that diamond is the hardest gem in the world by a wide margin, and while jade is not quite as hard as diamond it is actually tougher. Its resistance to getting damaged due to impacts is better than even a diamond. We all know sometimes men can be a little clumsy when it comes to their jewellery items. Men tend to wear their jewellery 24/7 doing everything from washing the family car to building a deck in the back yard. Precious jade is the perfect stone for such abuse. Being non transparent it doesn’t look any different if the back gets dirty. The simple domed cabochon bezel setting is basic and classic. It lacks sharp edges and claws that can wear or get in the way. 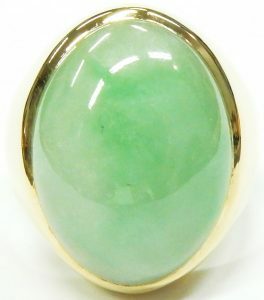 Jade has been used as a decorative ornamental gem since the stone age. It has been revered much more than even diamonds for thousands of years by many eastern cultures. The jade in this heavy weight gents ring is estimated to weigh 26 carats. It measures 22.0mm x 16.5mm and is securely bezel set in the very large size 12 1/2 gents 14 karat yellow gold ring that weighs 17.3 grams. This variety of jade can be incredibly expensive. While the specimen in our gents ring is nowhere near the finest available, it does approach some of the classic soft apple green hues of the most coveted pieces. 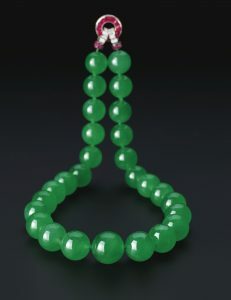 A jadeite necklace made by Cartier set a world record at auction in 2014 selling for $27.4 million USD and the largest bead was just 19.2mm diameter. Jadeite is a gem that just doesn’t show up very often around here. We’ve only had a few gents rings over the years sell through but none have been anywhere near this size. If you’ve got a large finger and are interested in an alternative to a gent’s diamond ring come in and have a look at this one. Estate priced at $1080.00 CAD. Stock #e10785. Get a great piece of jewellery and invest in some high quality gold all at the same time. It’s not unreasonable to imagine that in a few years there could be more value in recyclable gold content than the current price of $3135.00. All it would take is gold to appreciate by slightly more than 50% of the current trading price. If that doesn’t happen at least you get to wear a great necklace made from ultra high quality 18 karat gold. The basic style is a traditional curb link but every fourth link gets a white gold “X” soldered across the middle. The simple modification gives it a totally custom look. You never see custom made chain and I’ve never seen another example the same. At 20.5 inches long it could be worn by either a man or woman. Weighing over 52 grams, you’ll love the quality feel that dense 18 karat imparts. The 75% pure gold content also showcases the rich yellow colour not commonly seen in domestic jewellery. An oversized lobster style clasp secures the 6.5mm wide chain. Looking unworn and showing zero wear on any of the 60 links and catch. Estate priced at $3135.00 CAD. Stock #e9548. From our brief title descriptions you have all the information you need to figure out the value estate jewellery offers. Armed with a little knowledge the mysterious closed world of jewellery pricing is easier to understand, but mostly easily to compare. BIRKS is renowned for their high quality and great design. 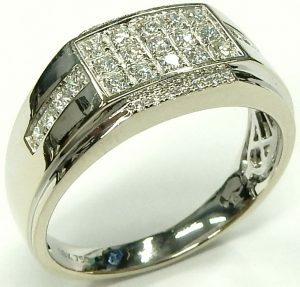 Made from premium quality 18 karat white gold this ring measures 6.0mm wide in a rather large finger size 12. At 9.4 grams and 75% pure gold you’ll immediately feel the quality. The slightly rounded inside shank makes the ring extremely comfortable. A low dome profile with the fine milgrain border has always been a timeless and popular design. Excellent condition only showing the odd little ding and scuff. 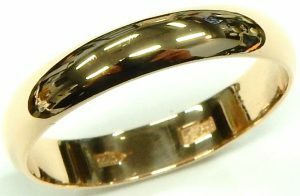 We will happily refinish the ring to perfect condition at no charge if you like; although the weight may be reduced by several tenths of a gram or so. 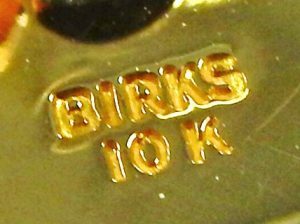 Similar on line offerings from BIRKS are priced at close to $2000.00 and more. Estate priced with just a little previous experience at $900.00. Stock #e9254. Let’s face it and be honest with ourselves, who doesn’t like to have at least a few nice things in life. Maybe it’s a great suit, an amazing pair of Italian shoes, a nice car or a beautiful home. Indulging yourself with the occasional luxury for hard work and rewarding yourself for a job well done does wonders in maintaining ambition. It can set the bar for achieving even greater levels of success, no matter how you measure it. Jewellery can be the item that can simply help you feel confident. A simple and masculine chain necklace could be just the ticket. Wear it under your shirt, or just visible with a couple open buttons. 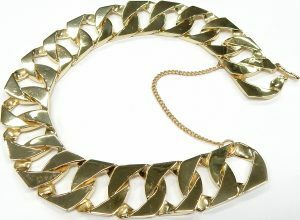 This 10 karat yellow gold curb link necklace is large and heavy but not over the top. As soon as you see the 7.5mm wide, solid link design weighing 32 grams you’ll immediately realize the quality. Italian construction ensures the highest standards of fit and finish, well worth the small premium you’ll pay for imported chain. Each link is smooth and flexible with a highly polished silky finish. At 24 inches in length it’s suitable for even a very large gentleman. In like new condition showing no wear of any kind in any of the 119 links. Secured by a sturdy lobster clasp with soldered shut jump ring. Estate priced at $1400.00 CAD. Stock#e10391. Rose and pink gold are becoming popular again. This chain was made in Italy by one of the best chain makers (Unoaerre) then exported to England for re-sale there as it has all the English hallmarks on the chain ends. What gives this chain it’s soft slightly pinkish tone is the slight bias of copper in the alloy mix. Not only does copper make the chain a little more pink but also very hard. The chain measures 19 inches long and weighs 14.6 grams. Secured by a sturdy lobster catch and freshly polished to look like new. Estate priced at $560.00. Stock #e6788. Slightly more style than the standard curb link gents bracelets you typically see. This bracelet has a longer link bridged by two bars. Made in upgraded 14 karat white gold the 8.5 inch bracelet weighs 32.3 grams. This bracelet shows like new with no worn joints. A super strong lobster catch is hinged for the totally finished look. Made in Italy with the manufacturer trade mark stamped into the end link. Estate priced at $2000.00 CAD. Stock #e6678. The English sovereign is one of the more popular gold coins that pass through our estate department and we never get tired of seeing them. The mythical depiction of St. George slaying the dragon never gets old, it’s no wonder this popular 22 karat gold coin occasionally turns up in jewellery pieces. As 6,550,000 were minted in 1978, the coin has limited collector value. As such you can wear it without fear of hurting the price with regular wear. There is little advantage to keeping the coin in its minted condition in the hopes of preserving the numismatic value. 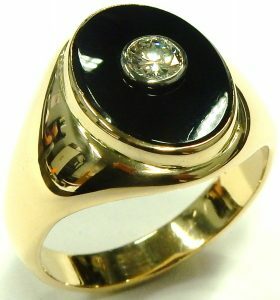 This allows the regal coin to become the center piece of some impressive rings, like this 9 karat example. The coin measures an generous 24mm diameter, giving great presence on a finger. The painstakingly detailed ring that carries it is almost invisible when viewed from above. At 14.8 grams (total weight) the ring is sure to make a statement when viewed from any angle and currently measures a finger size 9 plus. We can easily adjust the size larger to accommodate a bigger than average hand. Estate price $899.00 CAD. Stock #e10331. For strength and durability you have to go back to the basics, thick gauge interlocking chain links. 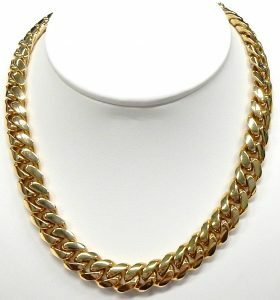 This 22 inch long chain consists of exactly that, flattened oval links. The 11.9 grams of solid 14 karat yellow gold end up being surprisingly eye catching as a diversion from the busier styles of most heavy chains. Newly refinished the chain comes equipped with heavy end caps and a strong lobster clasp. Estate price $770.00 CAD. Stock #e10038. Rose gold is picking up a lot of popularity in mens accessories as accents on watches, bracelets, wedding bands, or like this rose 20 inch curb link chain. It’s about time really, considering its unique soft copper colour is a really trendy alternative to the typical look of 10 karat yellow gold that men have been wearing for the last 40 years. 12.1 grams of highly polished of 10 karat rose gold is broken up by strong/secure yellow gold end caps. We’re not exactly sure why yellow gold was selected for the clasp; perhaps a suitable rose gold catch couldn’t be found but the slight difference in hue almost goes unnoticed. Estate price $540.00 CAD. Stock #e9966. Everyone loves a Volkswagen bug. If you’re of a certain age I’m sure you have a personal memory that includes this iconic little German automobile. Most people also know a “car” guy or girl. Wouldn’t this make a great gift for somebody who is into Volkswagens? The 1 ounce fine silver 999 Degussa wafer is still untouched in sealed plastic. It is easily attached to the key ring by an ingenious clasp system that can secure the wafer by two flush set screws. The total weight of the item is 44.7 grams or 1.43 oz. It’s an ultra rare and collectable little gift that someone will really cherish. Estate priced at $87.50 CAD. Stock #e10019. Finding a gents ring made from high quality ingredients can be a challenge. Men’s rings are assumed to be worn much harder than a women’s. They often get strapped with promotional quality diamonds and dull lifeless gemstones, and low karat gold. 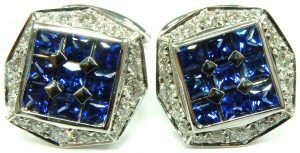 14 karat white gold men’s bands are few and far between but even more unusual is finding one set with top quality natural cornflower blue sapphires plus a VVS-H diamond. The channel set square cut trio have been thoughtfully integrated into the design. 0.18 carats of brilliant blue sapphires are contrasted by brushed natural white gold while the 0.07 carat diamond is accented by the bright, high polished rhodium stripe of the rings decorative groove. 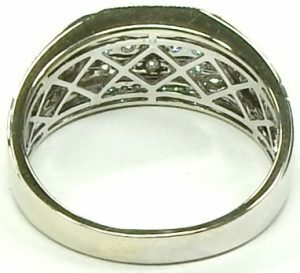 The inside of the band has also been decorated with a sturdy lattice work. The 6.4 gram 14 karat ring currently measures a finger size 10 1/2 with some room to adjust. Estate price $686.00 CAD. Stock #e10344. I can’t think of a more traditional and symbolic jewellery item than a simple band. A couple things make this example just a little more significant and important than most. It was skillfully hand crafted by local designer/goldsmith Michael Smiley and constructed with an unusually generous amount of high quality 18 karat yellow gold. 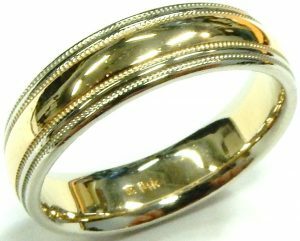 Well over 10 grams of 75% pure gold was used making the size 10, 6.0mm wide wedding ring. Its Tiffany profile has been the favored look in wedding rings for more than 100 years. 6.0mm is the most popular width and size 10 is the average gentleman’s finger size, making this design a safe bet for someone unsure of what style to choose. The inside of the ring has been rounded at the edges making for a very comfortable fit. Should your finger be larger or smaller than size 10 the malleable nature of 18 karat yellow gold will allow our goldsmiths to alter the size up or down as required. Looking like new the ring is estate priced at $900.00 CAD. Stock #e10494. For the price of a 10 karat domestic chain you can have this perfect condition UnoAerre 18 karat imported example made by the esteemed firm from Arezzo Italy. At first glance you may not consider the advantages of high quality worth the extra cost compared to a more typical offering. Once you see the beautiful finish and feel how silky smooth the dense 18 karat links are the quality becomes apparent. Large spring ring clasp, soldered shut connecting rings and the proudly embossed UnoAerro logo spacer link add a luxury finishing touch. Not only does 18 karat offer a superior rich true gold colour, the 75% purity is far more resistant to corrosion and oxidation. Corrosion can be a really big deal for necklaces. They are usually worn 24/7 for all activities; salt water, hot tube/swimming pool chemicals, perfume and even sweat can have adverse affects on the solder joints of lower karat chain. A necklace like this has close to 350 individual solder joints, it’s nice to know the 18 karat gold it contains is far more resistant to chemicals compared to 10 or even 14 karat. Weighing over 9 grams and 20 inches long the chain could be worn by a lady or gentleman who isn’t seeking a heavy looking bulky chain. The curb link design is a perfect choice to be worn with a pendant as the style doesn’t tend to kink. Estate price $709.00 CAD. Stock #e10444. Every once in a while we like to throw something out there that seems too good to be true just to see if you’re paying attention. At the current gold price of around $1675.00 Canadian per ounce this necklace contains over $475.00 in just the gold content. If you had to purchase a necklace like this new, expect to pay at least $1200.00 but more likely $1500.00 or more if you bought it from a chain store in the mall. A new, well priced necklace of similar construction has to sell for 2 to 4 times the actual metal value it contains to cover the cost of manufacturing and markups. This chain is in like new condition. Its heavy gauge 4.75mm hollow links show no wear and tear of any kind. An upgraded super secure plunger type catch with side safety clasp should provide peace of mind if you’re going to wear this all the time. At 24 inches in length it’s suitable for a lady to use over a top or sweater. The thick diameter and long length make it a logical choice for a gentleman too. If you’ve considered purchasing a good chain in the past but the price to get something substantial has kept you on the sidelines, this is your chance but don’t wait long. Call around, ask the most competitive jeweller around how much a 24 inch, 14 karat, 15.2 gram rope chain is worth and then we’ll see you later. They sure don’t come around at this price too often. Estate priced at only $600.00 CAD. Stock #e10490. This is one heavy piece. 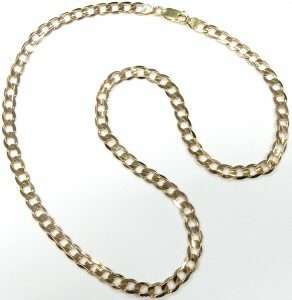 This figaro style chain measures 21 inches long and weighs over 66 grams. Thats over 2 ounces and it is 19 karat gold from Portugal that is 79.1% pure gold. For someone who wants a very high quality chain with some weight this one just might fit. Refinished to look new. Estate priced at $3660.00 CAD. Stock #e5214. UnoAErre have been an Italian goldsmithing institution since 1926. Founded with the goal of applying industrialization to the production of jewellery the company was the very first goldsmith company in Arezzo, Italy. Being the first they were assigned the trademark 1 AR, from which they took their name. This hollow example of a Gucci link chain carries all the quality you’d expect from such a storied Italian company. 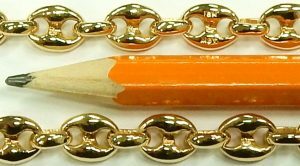 Measuring 24 inches long the 14 karat yellow gold chain shows no signs of wear and retains its original high polish finish. Though hollow the chain is nowhere near delicate, weighing a sturdy 14.1 grams and equipped with strong end caps and lobster clasp for added security. Estate price $893.00 CAD. Stock #e10039. The curb link is probably the most widely interpreted of all gents chain links and this geometric version is definitely one of the most popular. The strong rectangular link has a more open and airy appearance than its rounded counterparts while still retaining its super strength. Being so boxy the links also have the large highly polished surface area, allowing the 15.5 gram of 10 karat yellow gold to flash brightly with wear. Measuring a neutral 22 inches long the chain comes equipped with heavy end caps and a strong, easy to fasten lobster clasp. Estate price $594.00 CAD. Stock #e10336. I’m not sure if this can be considered jewellery since you can’t really wear it but it’s really cool. 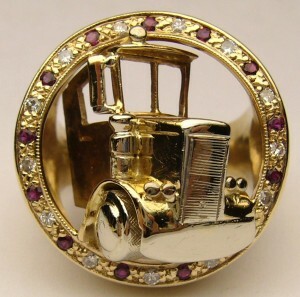 This little dump truck is hand made from 6 individual pieces cast in yellow and white gold. The wheels turn and the back tips to dump a very tiny load. The truck measures a little over 1 inch long and weighs 6.4 grams. This could make a great gift for someone in the construction business. We could easily solder on a jump ring so it could be used as a key chain etc. Estate price $400.00 CAD. Stock #e6360. 10kt. 6.9mm 23 inch curb link chain 43.5 grams $1890.00 CAD. We get a good number of gents chains passing through our estate department all the time. Sometimes they’ve been worn continuously for many decades and as such show too much wear to be sold in our estate department. We recycle this sort of material several times a year adding back into the world’s gold supply in a very environmentally friendly way. Once in a while one comes in that is in perfect condition. 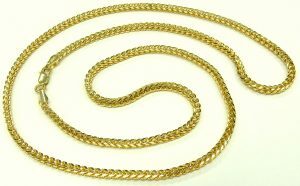 Well made and well taken care, this 23 inch long 10 karat yellow gold curb link chain is in like new condition. The hefty 43.5 gram chain is in virtually untouched condition. Just a quick light polish and a soak in our ultra sonic cleaner and it’s ready to go. The 6.9mm wide chain is appropriately equipped with super strong end caps and a large lobster clasp for added security. Estate price for this like new chain $1890.00 CAD. Stock #e10267. 10 karat gold Rolex President style diamond ring $770.00 CAD. The Rolex style ring is one of more timeless and universally admired gents ring on the market (just like the watch). The typical Rolex style ring mirrors the fluted bezel and round profile three segment President bracelet of the Rolex Day-Date model. This two tone 10 karat gold example adds a modern twist just like the modern smooth bezel Rolex Day-Date with a high polished white gold “bezel”. The smooth polished bezel surrounds 0.25 carats of I1-KL round brilliant cut diamonds. The white and yellow gold shoulders stay true to the original design, instantly evoking that Rolex feel. Many larger men’s rings are made hollow all the way down the shoulders to save on cost but this solid 8.5 gram ring is only lightly hollowed below the diamonds to allow for easy cleaning. The ring is brightly refinished and measures a finger size 8 3/4 with room to go up or down as needed. Estate priced at $770.00 CAD. Stock #e9729. 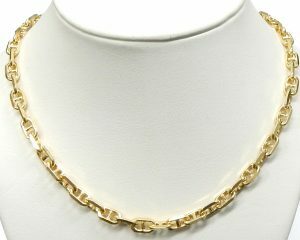 14 karat gold 24 inch Figaro necklace 17.9 grams $1050.00 CAD. Nothing unusual here right? Well, not quite. It’s not just the common Figaro chain consisting of one larger oval link connected by a few smaller round links. The larger ovals are connected by two figure 8 links. A simple design modification but one that makes this chain a little more unique. I’ve never seen one like it before. As with all of our estate chains this one is in perfect condition. Worn joints, kinks or stretched chains will not be tolerated and go directly to recycling. We won’t display an estate or previously enjoyed necklace that looks like its been worn. The only evidence this chain has had a previous life is the heavy 10 karat lobster catch is not original. 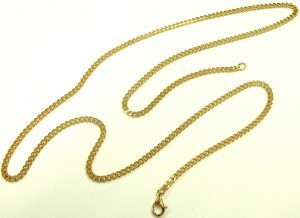 The original 14 karat clasp may have failed or deemed too frail for this 17.8 gram 14 karat gold chain. At 4.5mm wide and 24 inches long this item could be worn by either a woman or a man. Italian made as all the finest necklaces are this item is estate priced at $1050.00 CAD. Stock #e9221. 22 inch 10kt. 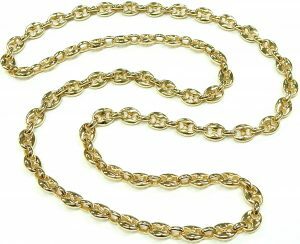 46.5 gram Unoaerre Italian gold chain $1620.00 CAD. 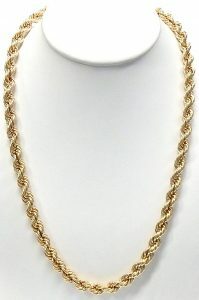 Man or woman this chain is suitable for both, you could even share it with your significant other. It’s a heavy one at exactly 1.5 troy ounces. Manufactured by one of the world’s finest chain and jewellery makers Unoaerre of Italy. It measures 22 inches long and 7.25mm wide. It’s hard to believe but at current gold prices (April 7 2016) there is over $1000.00 worth of raw gold in this chain. By the time pure silver and other trace alloys are added, the chain is manufactured, cut to length, ends and clasp attached, polished shipped from Italy to a wholesaler, resold to your local jeweller the value has increased to over 3 times just the gold value. Even brand new this ratio provides good value when compared to many consumer products. I mean consider the cost of that fancy new smart phone you own; in a few years it will be worth zero. Even if this chain was run over by a train there would still be $1000.00 worth of gold in it. If the price of gold continues to rise who knows, it may be worth more in just recyclable gold value than what our current estate price is. Excellent condition showing no measurable wear of any kind. The necklace is secured by a heavy duty spring loaded lobster clasp. Freshly polished looking shiny and new. Estate priced at $1620.00 CAD. Stock #e9592. 18 karat gold Kings link 26 inch necklace 61 grams $3850.00 CAD. Weighing just short of 2 troy ounces you have to consider this a heavyweight when it comes to gold necklaces. Not only does it weight over 61 grams, it’s made from beautiful 18 karat yellow gold. 18 karat means, 18 parts out of 24 (by weight) are pure gold making the entire chain 75% pure gold. Of course there is a tiny little steel spring in the clasp that isn’t gold but you get the picture; this is a very high quality item. Most domestic chain is only 10 karat gold or 41.7% pure. 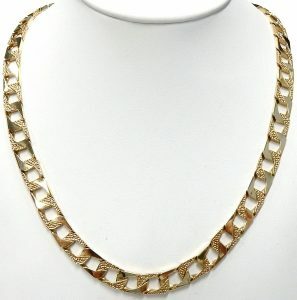 The 26 inch length is perfect for a big guy or a lady that wants a substantial chain to wear over a top. The Kings link design is much less common that a curb, rope or box link but with design elements of all three making for a high end look. The necklace measures exactly 3.5mm wide but looks much wider due to the square cross section. The necklace displays virtually no wear in any of the flexible joints. Only a light surface polish and cleaning and it’s ready to go. Secured by a large lobster clasp with sturdy spring lock. Estate priced at $3850.00. Stock #e9923. Jewellery is often described as art. Wearable art doesn’t get more artistic that this pair of Bjorn Weckstrom gold cuff links made for the Finnish jeweller Lapponia. They really have a 60s 70s modernist Scandinavian look and feel to them. Substantial is size they measure 20mm x 18mm and weigh almost 1/2 an ounce at 14.6 grams. Bjorn Weckstrom is an “artist’s artist” working with many different materials from precious metals to plastic, marble and even old sails from ships. One of his more famous jewellery pieces, Planetaariset Loaksot (Planetary Valleys) was worn by Princess Leia in the 1977 motion picture Star Wars. These are really cool and make a great conversation piece. Excellent original condition never polished or refinished. Estate priced at $840.00. Stock #e7488. © Bill LeBoeuf Jewellers 2017. All rights reserved.